Here we are getting back with a continuation to the top list of the responsive WordPress themes which are worth choosing. You will find another 20 best responsive WordPress themes which are multipurpose. We hope that this kind of list is helpful to you because of importance to integrate responsive design to your business representative website nowadays as well. With a pleasure we are presenting to you Skylab – modern and easy controlled theme which is slider designed for photographers, illustrators, graphic designers, art and creative directors, movie directors, architects, luxury businesses or bloggers. This hardware accelerated photography WordPress theme is adopted to showcase design or photography projects. Look through out this theme features list and do not remain indifferent! Skylab was built on the latest programming technologies and shows up the highest level of WordPress theme developing. Retail Therapy is a responsive WooCommerce WordPress theme (try resizing your browser), suited for users who want to create a business, portfolio or eCommerce site. It comes with a plenty of options so you can modify layout, styling, colors and fonts directly from within the back-end. The slideshows, skins (which are easy to modify from your back-end), font and color options as well as dynamic template builder will help you create the website you need in no time. This WooCommerce WordPress theme is built with SEO best practices in mind. It uses semantical valid HTML code and CSS so search engines can index the content of your site with ease. The Retailer is a responsive WooCommerce WordPress theme that utilises the powerful plugins to create a versatile WordPress-powered shop with many layout options and unlimited color variations. The Retailer has a convenient administration panel which provides tons of options to manage and modify any aspect of the theme – it is well suited for both beginners with no coding knowledge and developers. With this WooCommerce WordPress theme you are well equipped to get a high Google ranking and attract visitors to sell them your fabulous products. The theme allows you to change all the main colors (background color for titles, color of title fonts, color of hover elements, color of shadow used on text) along with the background. This means that you can change all the colors and looks of the theme with just a few clicks. This WooCommerce WordPress theme is suitable for companies or individuals. It is a great way to present your work at the highest level. It is based on popular Twitter Bootstrap framework and uses the latest HTML5 and CSS3 technologies. Ypsilon is retina ready with 8 color styles, white / black version, parallax ready and much more. All the added features are fitted to nowadays business: Retina Ready, Revolution Slider (you do not need additional plug-ins), Parallax (one screen to show everything in a one place, do not require lots of tabs to open), Google Map and Fonts integration too. Built in a case to left you comfortable all the time using it. Barberry is a modern and fully responsive Retina Ready WooCommerce WordPress theme based on Twitter Bootstrap. Start your store right away with Barberry theme. Built on the Twitter Bootstrap wide 12-column responsive grid, so now you can sell your products anytime, anyplace, on any device. Witt customizable design and layout create your own unique site design and page layouts. Always updating and supporting theme is the best decision to those who are looking for a solution to their managing business on the internet. This WooCommerce WordPress theme is an elegant responsive theme built on Twitter Bootstrap clean and easy to customize. 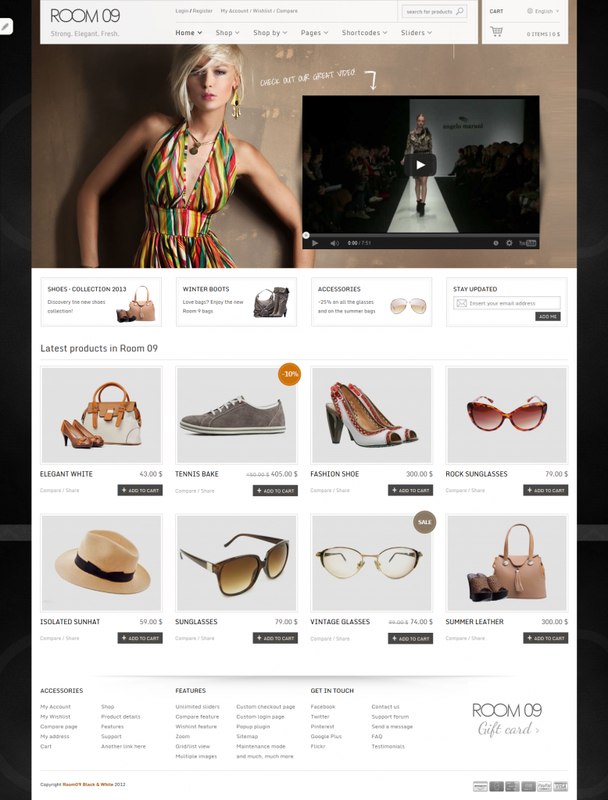 Shoppest is specially designed for fashion store, particularly, clothing, accessories, shoes and jewelry. It has such a modern design style that many customers request. Extremely clean and neat, pure white is a perfect reflection for your products.Besides, with all powerful built-in features, your stores will be at its best performance. Responsive layout that changes screen size as visitors resize browser, will save buying mobile version cost for you as well as will satisfy any person shop on your store. This WooCommerce WordPress theme is the best solution to those who are looking for the best equity between price and features added. Sellya is a fully responsive (great looks on desktops, tablets and mobiles) WooCommerce WordPress theme for any store, it uses Bootstrap and it’s created by using the latest HTML5 and CSS3 features. This WooCommerce WordPress theme with unique square look applying the latest flat-design style trend. It is perfect either for eCommerce site, online boutique or creative business website. With responsive feature, you no need to worry about losing sales just because your potential customers failed to load your website page completely using any device. With responsive feature, you no need to worry about losing sales just because your potential customers failed to load your website page completely using any devices. Unlimited colors will help you to fit this theme with any color of your logo or other business outfit. This WooCommerce WordPress theme include a lot of premium features like the Wishlist and the compare products features, the product enquiry form (to use the theme like a catalog, without the cart) and the great ajax layered filter. Sistina theme has a tool for you uploaded product zooming and is able to SEO optimize your every page. Each page comes with several layout options along with amazing features and widgets that gives you unlimited choices to customize your website. Try it! Lotus Flower – it’s flexible and has a fully responsive WordPress WooCommerce theme which looks beautiful on Retina-Displays. Lotus Flower is very intuitive to use and completely ready to operate out of the box. All the added features would left you satisfied with a website loaded with your own content. This attractive to customers eyes design of the WordPress WooCommerce theme is fully completed with Drag & Drop Page Builder, WooCommerce Support, Intelligent Admin Panel, WPML Ready, Revolution Slider Plugin features and much more. Awesome page builder, beautiful responsive design, unlimited colors, post format supports and documentation and video tutorials for your easiest exploitation are all you need for you daily work to up-to-day website content with any interruptions. 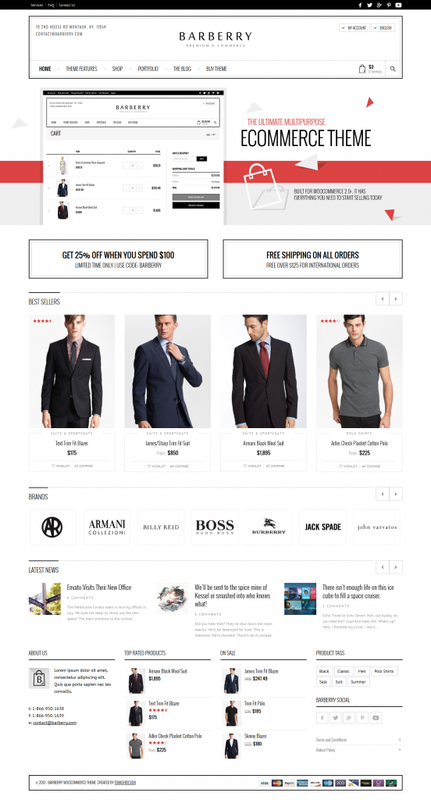 PrimaShop is an attractive, modern and functional WordPress WooCommerce theme. Branding your online store is really easy using this WordPress theme. This theme’ design settings uses built-in WordPress Theme Customizer where you can change colors and backgrounds on all sections of your site with live preview. On this WordPress WooCommerce theme are given to you 9 different content layout possibility from one, two, or three columns. You can also change the content layout per post/page/product when editing your post/page/product. PrimaShop theme comes with “easy to follow” video tutorials to show that it is really easy to use for you! 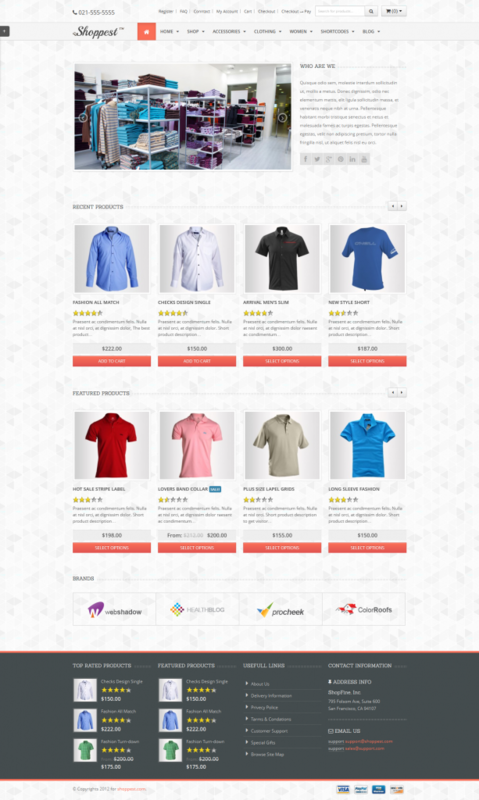 Room 09 Shop is an awesome and functional WordPress WooCommerce theme which is rated in the highest level. This theme makes full use of the new customization options in the latest version of WordPress. This WordPress WooCommerce theme have implemented an extensive color scheme options panel so that you can change the color of your theme to anything you like. When viewing the demo, be sure to resize your browser window there are some cool responsive effects going on here. It is also responsive too. WooCommerce have built in comprehensive shipping settings enabling you to define shipping costs per product, or declare a flat rate for all your products, you can also offer free shipping. Extend these options with our table rate shipping extension to define different shipping rates for various countries, or different weight brackets. Please, come in to the Room 09 Shop and enjoy the cozy interior and easy controlled system. JOOP is a flexible and responsive WordPress WooCommerce theme which would let you stay enjoy about your e-commerce business managing. This WordPress WooCommerce theme is built on the solid TD-framework, suitable for using child themes, and already prepared for Woocommerce, bbPress, WPML, and contact form plugins Gravity and Contact 7. Despite all the premium features are included already, you will be satisfied with the informative documentation about this theme installation and setting up the options and support staff, webdesigners and developers who are standing by to answer all your questions you may have. Pandora is a beautiful responsive WordPress WooCommerce theme inspired by modern eCommerce designs. 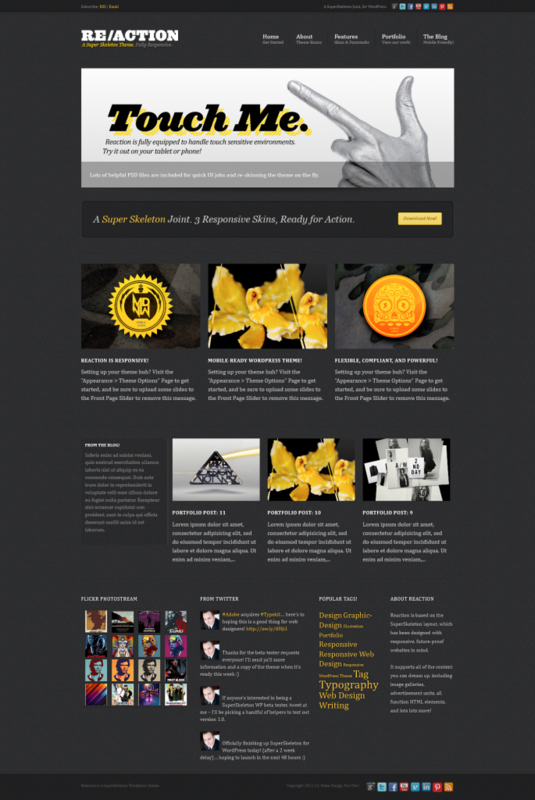 This theme supports responsive layout with css3 media queries, each and every element are fully responsive. And the responsive mode can easily be turned on or off via theme options. Create strong shop with multiple layout options, and impress your customer with any built in system provided will make you the perfect online shop ever. Flatsome is an awesome responsive WordPress WooCommerce theme with Parallax effect on UX Banners. Choose this one theme if you want to create your shop to look amazing and be loved by your customers. Other clients, who were bought this theme and customized it for their business, are more than satisfied with this WordPress WooCommerce theme. The clients using this theme is happy for cool design and lots of in-built features. If you have any pre-sale questions or need help installing your theme you could contact with this theme friendly support staff. 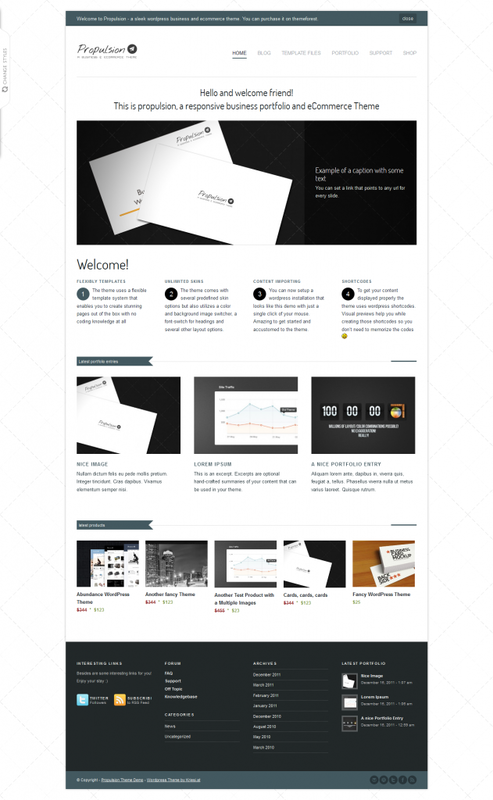 Enfinity is an awesome responsive WordPress WooCommerce theme. Show off your work with this easy-to-customize and fully featured theme. When purchasing this theme, you will receive a detailed documentation too. Enfinity has a convenient Administration panel which provides tons of options to manage and modify any aspect of the theme – it is well suited for both beginners with no coding knowledge and developers. The theme comes with a plethora of options so you can modify layout, styling, colors and fonts directly from within the back-end of your WordPress WooCommerce theme. Xing is a clean and modern WordPress WooCommerce theme. This is designed for corporate websites and e-commerce ventures. All the added features makes this theme functional and easy controlled. This WordPress WooCommerce theme can be used for small to large business setups, online shopping stores, personal portfolio, or as an editorial blog. Supported with custom templates, widgets, short codes, and customization options; the theme can be a suitable choice for your business/ecommerce projects. Propulsion is a responsive WordPress WooCommerce Theme (try resizing your browser), suited for users who want to create a business, portfolio or eCommerce site. 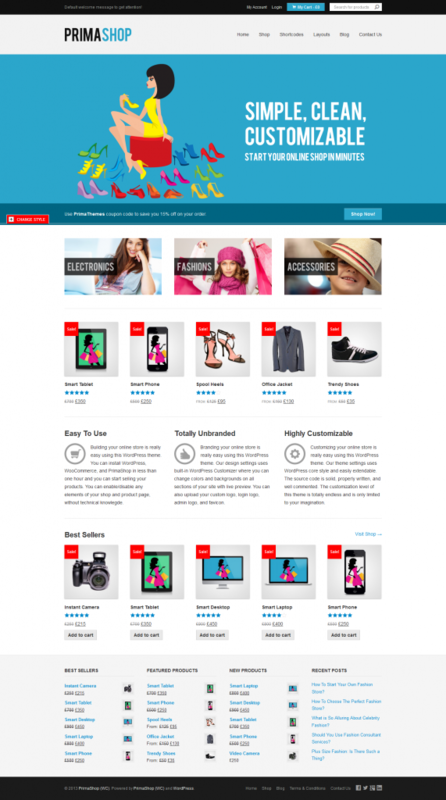 The theme is built on top of the fabulous woocommerce shop plugin as well as the bbPress Forum plugin. 3 Slideshows, 21 predefined skins (which are easy to modify from your backend), font and color options as well as dynamic template builder will help you create the Website you need in no time. The theme is built with SEO best practices in mind. It uses semantical valid HTML code and CSS so search engines can index the content of your site with ease. With Sahifa you’re getting more than just a theme, you’re getting a new way of approaching them. With an innovative separation of design from content, creators have put everything you could every wish to customize into one easy to navigate option panel. 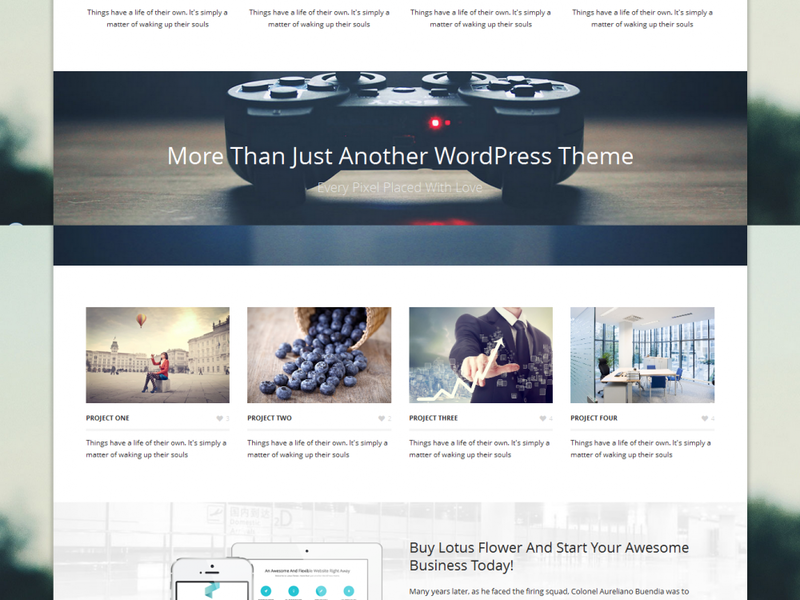 This WordPress blog theme have all what you could think about. Check out all the features list and be confident an assured with your choice to have this theme. Jarida is a clean responsive magazine, news and blog template. Quick to setup and easy to customize, thanks to the powerful admin panel, and the detailed documentation, Jarida is the perfect theme for showcasing your most important work directly in front of your potential clients. This WordPress blog theme has got you covered on all fronts, so if you ever get stuck on anything, rest assured that you’re going to get the help of a professional, if and when you need it, because Jarida comes with excellent customer support. This WordPress blog theme is a responsive, which means it adapts to the device on which it’s displayed. The theme cares for your content so it looks great on all devices, but you can also decide to show part of a content on some versions only, and hide on others. Also the portfolio is fully responsive (all types of them) and can include images, sliders or videos. Items on a portfolio list may include tags, title and description (everything optional). Different image proportions in one portfolio set are also supported. Portfolio items can be filtered dynamically by category or tag. Or you can use pagination instead. This is a creature for all bloggers and broadcasters with a social media tool included.